In this section we show a list and a brief description of the published works of sister Mary of Jesus of Agreda. Editorial: Fareso. Introducción, notas y edición por CELESTINO SOLAGUREN, OFM con colaboración de Ángel Martínez Moñux, OFM y Luís Villasante, OFM, Madrid 1970, reimpresa en 1982, en 1992 y en 2008. Topic: The Mother Maria de Jesus, for obedience to the mandate of the Lord, decides to write this “divine History and Life of the Virgin,” explanatory subtitle of the God’s Mystical City with the one that its authoress defines. It takes as a direct reference the history of the salvation of the men, which culminates in the person of Christ and his Easter mystery (SC, 5), across the Life of the blessed Mother. The pages of the Gospel and the whole Holy Writ, with the education of the liturgy and of the Teaching of the Church, will be her explanatory baseThe richness of her baroque language and the occasional resource to the works in use among the ecclesiastic contemporary writers, particularly in the so called “Lives” of the Virgin, they provide the ornamental resources to her for her symbolic narrative. It is not so much a Marian biography, accurately of information and historical facts, a description of the interior life, spiritual, of the soul of the Mother of the Lord, the full of grace (Lc 1,28) from the first instant of her being in the divine plan. The God’s Mystical City, or “divine History and Life of the Virgin Mother of God ” announces Maria’s existence from the eternal plans of the Father up to her eschatological presence in the life of the Church, of which she is her Mother and Teacher. For the concrete facts that indicate her life: Immaculate Conception, Virginity, Divine Maternity, her association to the person and to the redeeming work of Christ Jesus, her Son; her Asuncion to the skies and maternal Mediation on the Church, sue finds her reflection in the educations of the Holy Writ a doctrine Christological-Mariological, considered like of a ” illuminated precursor ” of the Mariology of the Council Vatican II, promoter, simultaneously, of the worship of imitation and service to the Virgin, Mother and Teacher of the Church, as Paul VI and Juan Paul II, following the Mariology of the Council, they propose in their teaching. The Mystical City of God is one of three works of its century more times printed, together with works of St. Luís Maria Grignion de Montfort and St. Alfonso M. de Ligorio. Sister Mary of Jesus in obedience to her confessor, the Father Andrés de Fuenmayor, towards the end of her life, for the years 1661-1665, writes her autobiography, which will remain incomplete, only she could write the preamble of the work and two agreements, the second one of these, incompletely. Her numerous diseases and finally her death do not allow her to advance very much in the work to conclude it. This autobiography is in the so called “TOMO V”, which is a biography of sister Marie if Jesus: is was printed in Barcelona by Herederos de Juan Gili, editors 1914 y reprinted in 1985, Madrid. Editorial: Las Heras. Presentación, notas y edición por ÁNGEL MARTÍNEZ MOÑUX. Monasterio de la Concepción Ágreda Ágreda-Soria, 2005. Topic: The relationship of the soul with God: the divine perfection is sung and the excellences of the Loved are celebrated. Concrete topics: the angels like guardians and counselors, the love between the soul and the husband, the powers of the soul, exterior and interior senses, politically active church, the grace, the free will, the sacraments, the faith, the creation of the soul and of the body, the vision of the Baby Jesus, diverse prayers and canticles, etc. She finishes with Christ’s praise put in Maria Magdalena’s mouth. The intention of Sister Maria seems to be: to prevent the spirit from getting weak by means of the contemplation of the greatness of the divine attributes. This one can be the first writing of the Venerable; probably she had 19 years old. The interlocutors were six angels: Graciel, Nunciel, Saciel, Baraquiel, Agael, Maraquiel. In some moments it resembles the “Spiritual Canticle” of St. Juan de la Cruz. 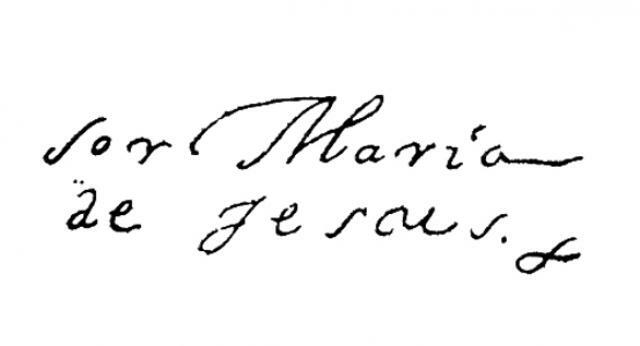 Original Title: “Apuntamientos espirituales de la Venerable M. María de Jesús, desde el día 24 de junio de 1652.” Spiritual notes of the Venerable M. Mary of Jesus from jun24, 1652. Editorial: Monte Carmelo. Introduction, transcription, notes and edition by MANUEL PEÑA GARCÍA. Burgos 2005. Topic: mystical Evolution of the authoress between 1651 and 1655 (June 24, 1651 to August 15, 1655). For Andrés de Fuenmayor’s advice (her confessor from 1650 to 1665) begins to write her experiences; Fuenmayor’s aim was that ” in advance nothing from what it was happening in sister Maria it was possible to escape to the examination and study that he was proposing to do. It is formed by 37 booklets. She pointed in them her experiences weekly. It gathers the experiences of when she tries to write the Mystical City of God for the second time. She refers her spiritual nuptials, her mystical deaths, her three “novitiates ones”. The process of the MCG can be followed through this work. 1) First novitiate: she enters a new way of imitation of Maria, not only like disciple but like daughter, adding to the four votes of her religious profession the fifth one: “to obey to the same Lady in the doctrines that, like teacher, She gave her”; 2) Second Novitiate: relation with the humanity of Jesus Christ and the divinity; 3) Third novitiate: she does the profession of “first”. Editorial: Print Alse Graphs. Facsímile edition FRANCISCO JAVIER FUENTE FERNANDEZ. Rights: Convent of the Conception of Ágreda, Leon, 1993. Topic: The confession; she manifests her intention of achieving it every Saturday; she divides the reflection in before and after the confession; before one she refers to the fear of not having realized the previous confessions correctly, to her lack of love to God and to her faults in the divine office; later one she refers not to returning to offend God and to do firm intention of perfection. In the second part she manifest her desire to live being adapted to the spirit and with a expressed resignation to the meat, fulfilling everything promised to God. She finishes with a renovation of the intention of perfection. It reflects two different moments from the life of Sister Maria, separated probably by the disease. It contains: mystical doctrines, the light received in the different types of knowledge, the authentication of her visions and inner speeches. It did not appear in the index of Sister Maria’s books. It remained in private possession. Publishers: Herederos de Juan Gili, Editores. Place – year: Barcelona 1915. Size – pages: 18,5 x 12,5, 128 pg. Topic: It is about a religious experience. There are twelve steps to get perfection and twelve to go to perdition. Size – pages: 18,5 x 12,5, 103 pg. The original one has 128 17 x 12 cm pages. Topic: Mystic doctrine. Dedicated to those who consecrate their lives to the mystic-nuptial union with God. The original is in Agreda: 167 small size paper. Publishers: Editorial Litúrgica Española, SA. Sucesores de Juan Gili, editores. Place – year: Barcelona 1920. Size – pages: 576 pg. Topic: Meditations, observations, resolutions to perfection (taken almost everything from The Mystical City of God). Publishers: facsimile edition by Francisco Javier Fuente Fernández. Place – year: Leon 1993. The first part was published on 18th April 1660; the second one, probably near her death. Size – pages: pg 136. Original: 210 x 150 cm. , s.p..
Topic: Our Lord’s Passion according to the four evangelists. Place – year: Barcelona 1879; edition’s director Ramón Buldú. Size – pages: 291 pg. Topic: It is a prayer book. A brief catechism is included. The original one is in the archives of Agreda: handwritten by the Venerable. Publishers: Convent of the Immaculate Conception in Agreda. On sale in the Convent. Publishers: Herederos de Juan Gili, Editors. Place – year: Barcelona 1914. Second edition in Madrid 1985. Size – pages: pg 18-80. Topic: Her parents´ customs, virtues, the convent foundation …. Publishers: Herederos de Juan Gili, Herederos. Size – pages: pg. 81-101. Place – year: Madrid 1975. Size – pages: pg 124. Topic: It is a summary of religious life for 33day retreats. 22 years of correspondence. 311 letters by Sister Mary and 303 by the King. ARTOLA, A., Mª. , Dictamen histórico-teológico sobre la Mística Ciudad de Dios…, Deusto 1993, pg 262-266. BARANDA,C., Correspondencia con Felipe IV: religión y razón de Estado. María de Jesús de Ágreda, ed.Castalia; Instituto de la Mujer, Madrid 1991. BERLANGA, Manuel R.de, Sor María de Ágreda y su correspondencia con Felipe IV, imp. Del “Correo de Andalucía”, Málaga 1886. PÉREZ VILLANUEVA,J., Sor María de Ágreda y Felipe IV: un epistolario en su tiempo, Madrid 1979. [s.n.]. SECO SERRANO,C., Epistolario español. IV y V, Cartas de Sor María de Jesús de Ágreda y de Felipe IV. Edición y estudio preliminar de Carlos Seco Serrano, ed. Atlas, Madrid 1958. SILVELA,F., Cartas de la Venerable Madre Sor María de Ágreda y del… Rey Felipe IV; precedidas por un bosquejo histórico, ed.Sucesores de Rivadeneira, Madrid 1885-1886. TORRENTE BALLESTER,G., Correspñondencia con Felipe IV. Sor María de Ágreda; selección y prólogo por Gonzalo Torrente Ballester, ed. Fe, Madrid 1942. CAMPOS,J., Otras cartas inéditas de la Venerable sor María de Jesús de Ágreda, s.l., s.f., BPE en Soria. 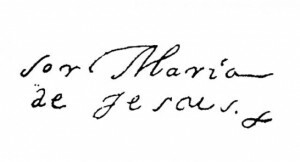 HERNÁNDEZ JIMÉNEZ, José Antonio, Sor María de Jesús de Ágreda y su correspondencia con la diócesis de Calahorra, ed. Centro de Estudio Sorianos, Soria 1994. HERNÁNDEZ JIMÉNEZ, José Antonio, Tres cartas autógrafas de la Venerable en Calahorra, ed. Centro de Estudios Sorianos, Soria 1985..
GALLEGO, José Andrés, Una carta original de Sor María de Jesús de Ágreda, ed.Centro de Estudios Sorianos, Soria 1972. GOÑI GAZTAMBIDE,J., Una carta inédita de la Venerable Ágreda, ed.Centro de Estudios Sorianos, Soria 1981. VÁZQUEZ JANEIRO, I., Carta autógrafa de la Madre Ágreda, en Fundación Universitaria Española, Madrid 1986, pg 369-375.